Travels with photographer Steve Barry along the rail lines of the United States and Canada. 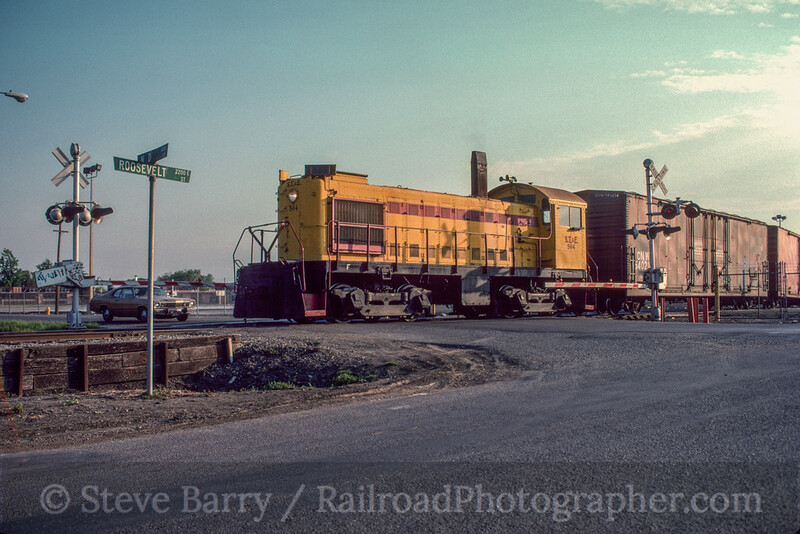 Steve has been photographing railroads for over 30 years. In the last few editions of Cool Chromes we have been looking at scenes from my first trip ever to California in May 1991. 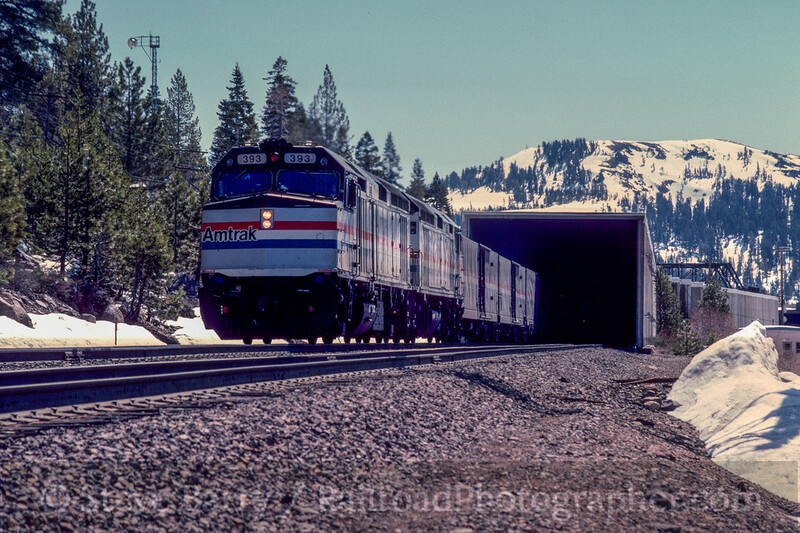 In the first part we looked at a few random images; in the second part we focused on the Santa Fe Railway; and in the third part we chased Southern Pacific 4449 from Klamath Falls, Ore., to Sacramento. In this final installment, we'll do a quick tour from north to south in the Golden State. Since this was my first trip to California, I had to see it all and did cover the whole state from the Oregon border to San Diego. We'll start this last tour high in the Sierra Nevada as the California Zephyr emerges from the snowshed at Norden and is about to make its descent down Donner Pass on Southern Pacific tracks. Even this late in the year, the winter snow remains piled high. Our next stop is in the Central Valley below Sacramento. Stockton is the easternmost port in California that ocean-going ships can reach (it's well inland, but the San Joaquin River is navigable from San Francisco Bay) and as such is a busy rail center. Two short lines serve Stockton, the Central California Traction and the Stockton Terminal & Eastern. During the 1991 visit the ST&E was still powered by diesels from the American Locomotive Company, including S4 No. 564 built in 1951. West of Stockton, the upper Bay Area is full of refineries. 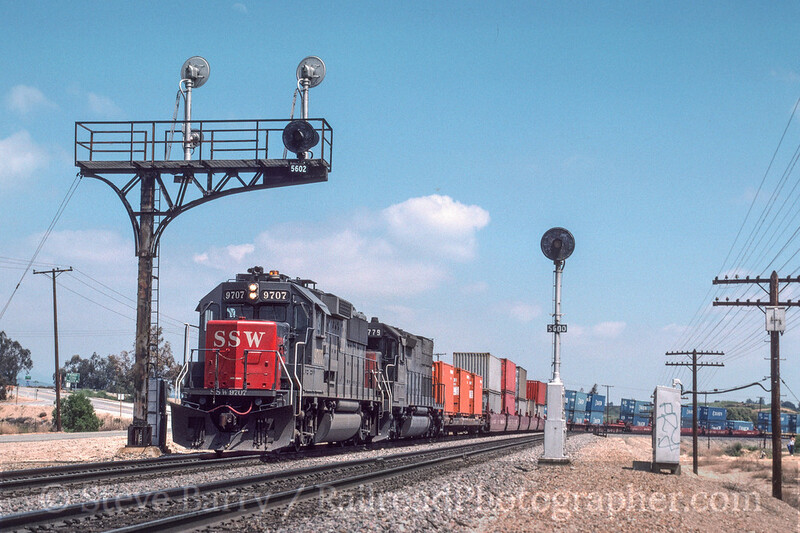 We caught Southern Pacific SW1500 No. 2662 hauling tank cars near the passenger station in Martinez. 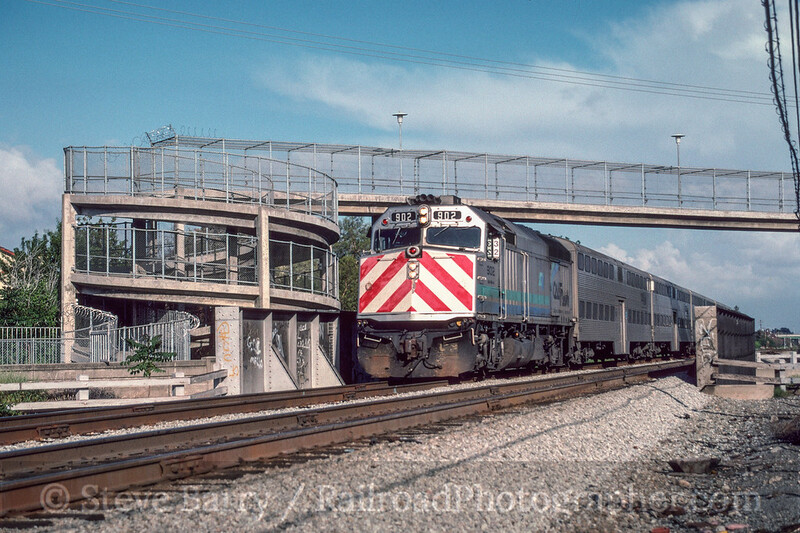 In 1991 only a couple of Amtrak trains served the small station here. 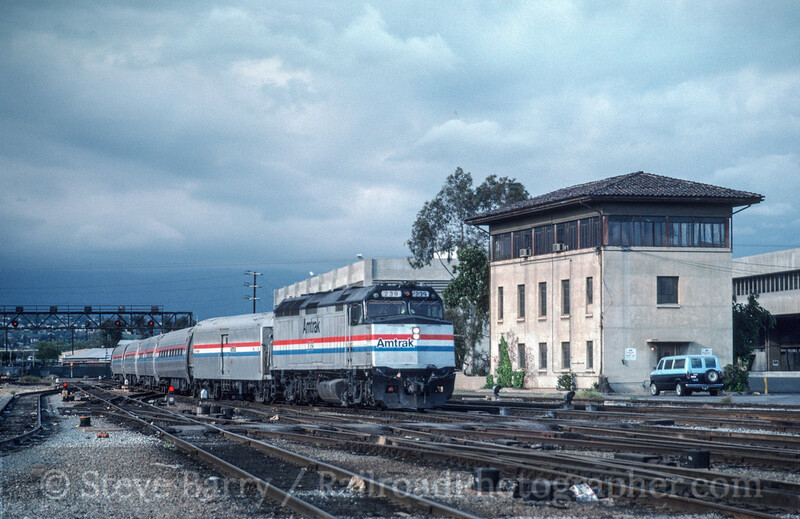 However, Amtrak California greatly expanded service in the region, with trains serving Sacramento and Bakersfield from Oakland passing through Martinez. Today Martinez has a brand new station that serves over 30 daily trains. Moving down along the Bay, we are on the south end of the peninsula just north of San Jose to see Caltrain action at Santa Clara. Caltrain is the commuter line that heads south from San Francisco to San Jose, with limited service beyond to Gilroy. The circular ramp made a nice photo prop for F40 No. 902. Note the train number boards sticking out near the cab window indicating that this is train No. 32. Down in Los Angeles, the only passenger trains serving the city were Amtrak trains, coming into recently restored Los Angeles Union Passenger Terminal. On the way into the station, trains had to pass by Terminal Tower, which controlled movements through the complex. Here's a somewhat unique Amtrak train with a baggage car and Amfleet cars; double-deck Superliners are more common in the west. Up next we head out into the desert east of Los Angeles on the former Southern Pacific. In 1991 Beaumont Hill was not seeing much traffic -- the stack train boom was in its infancy -- but it was still worth a visit. We caught GP60 No. 9707 (lettered for SP subsidiary St. Louis Southwestern -- better known as the Cotton Belt) passing under a cantilever signal bridge in Beaumont. 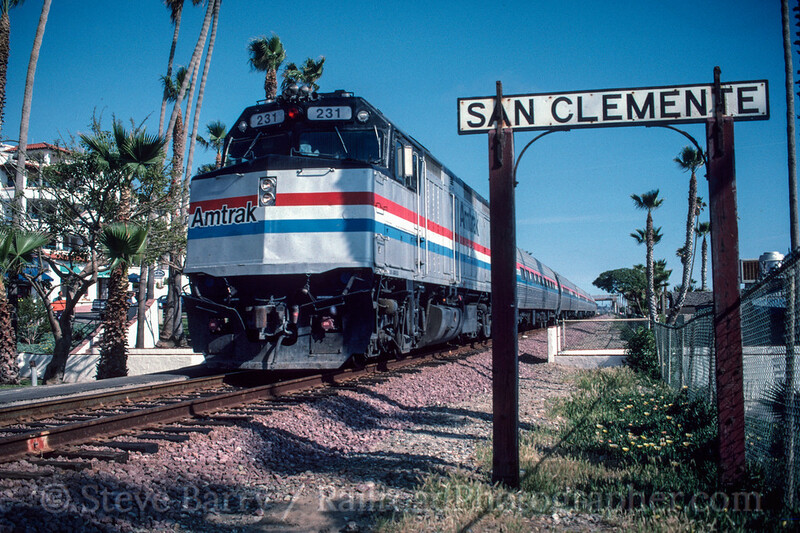 Next, we find an Amtrak Surfliner heading south (the locomotive is actually pushing the train) as it heads through San Clemente. In 1991 the coastal town was only 17 years removed from its claim to fame as the location of the Western White House, the residence of President Richard Nixon. We started our tour on snowy Donner Pass and we'll finish our tour basking in warmth of the Pacific sun. In 1991 Los Angeles had no commuter train service -- Metrolink was still a couple of years away -- but there was one commuter-ish train running down the coast line from Los Angeles to Oceanside. 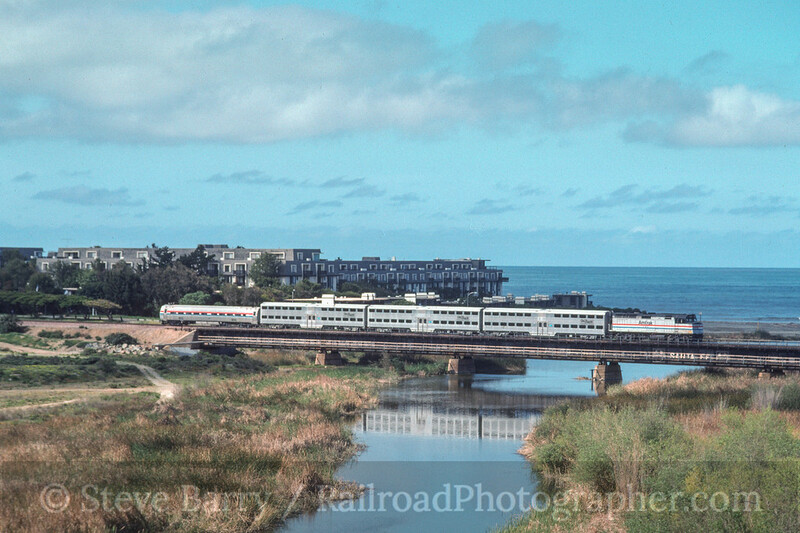 The train had double-deck gallery cars from Caltrain's San Francisco commuter service, with an Amtrak F40 on the south end for power and an Amtrak cab car on the north end for the northbound trips. We see the train at the end of the run as it comes into Oceanside. 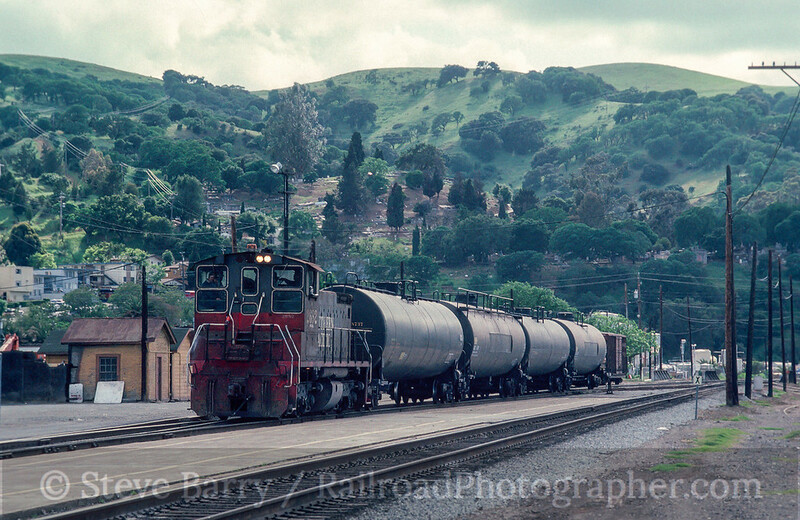 This concludes our tour of California in 1991 and you can see why the Golden State is almost railfan heaven! The Last Providence & Worcester Passenger Train? All photos are copyrighted and not in the public domain. Awesome Inc. theme. Powered by Blogger.